One of the key decisions a beekeeper has to make is which type of hive will best suit their desired style of beekeeping. Here is a brief introduction to the 4 major types of beehives, the benefits of each, and how they are made. When we think of a man-made beehive, we tend to imagine the Langstroth design. 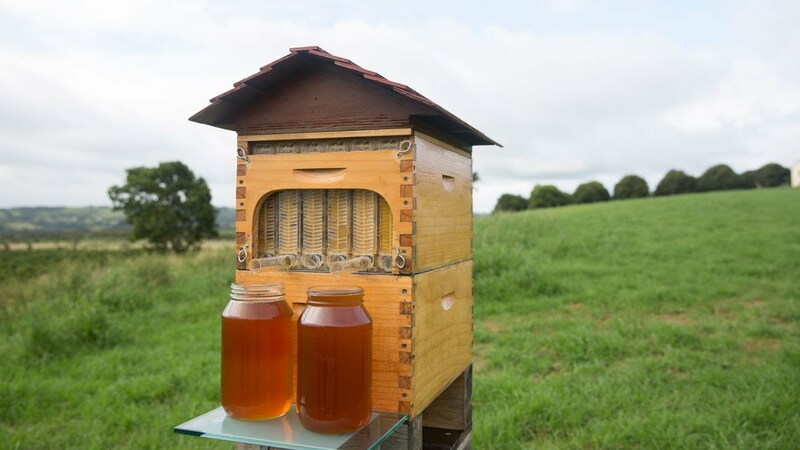 Invented by Lorenzo Langstroth in 1852, the Langstroth Hive is the most popular hive design to date due to the simple yet innovative construction of the vertical frames. These frames allow the honey bees to build natural combs that allow them to produce honey quickly and efficiently. The Bottom Section: This includes a bottom board and a hive stand. The bottom board creates an entrance so every honey bee can enter and exit the hive freely. The hive stand keeps the hive off the ground and prevents water from leaking into the entrance. Hive Boxes: These stackable boxes house the hive itself. Each hive box is made up of 8-10 hanging frames that house honey, pollen, propolis, and bee brood. The boxes come in different sizes, allowing you to customize your hive based on your particular colony needs. You can also order a variety of different frames specifically created for collecting honey or housing brood. The Upper Section: This section is used to secure your hive, and consists of an inner and outer cover. The inner cover sits on top of the highest hive box and features a hole that can be used as an entrance or feeding. The outer cover goes on top of the inner cover to contain and protect the hive. Unlike the Langstroth hive, which is divided into 8-10 large frames, the top-bar hives are made up of roughly 30 individual combs. This means that the beekeeper will have to remove and inspect each individual comb, rather than being able to pull out entire frames. Legs: The legs keep your hive off the ground at about waist level, eliminating the need to bend and lift heavy hive boxes. Most top-bar hives have four legs made of a sturdy wood that will support the full weight of the hive. Box: The box is a large wooden container that will become the foundation for your hive. There are a variety of different variations of a top-bar box, including numerous dimensions and side angles. The box holds the top bars, which are pieces of wood that lay across the box as a surface for your bees to start building their hive. Top: The final piece of the top-bar hive is a hinged top, which hangs down over the box to protect the hive from the elements and keep everything together. The Warre hive is a variation of the top-bar hive with some unique features that focus on aiding the needs of the honey bees. Created by Abbe Emile Warre, a French designer, the Warre hive aims to imitate the ideal conditions for a wild beehive. The unique design allows the bees to build hives as they do in nature by creating the comb from the top bar down to the bottom of the box. These types of hives are described as low maintenance, due to their close reflection of a natural hive design. Base: Unlike the Langstroth hive design, the Warre hive has both a base and bottom board. The base keeps the hive off the ground, while the baseboard acts as an opening for the bees to come and go freely. However, the entrance is typically smaller than one found on a Langstroth hive. Boxes: The Warren design also features boxes to house their hive, though the dimensions of the boxes are much smaller than the typical Langstroth box. This is done to more perfectly mimic the places that bees naturally build their hives in. Roof and Quilt Box: The final top layer is made of a thicker wood in order to protect the hive from the elements. It also features a “quilt” of wooden shavings, which help keep the hive insulated. This is a new type of hive that is aimed at making the harvesting of honey easier on the beekeeper. Similar to the Langstroth hive, these hives have frames that can be fit into a standard size box. However, the unique construction of these frames allows the honey produced to easily flow through the comb. Instead of full comb cell, flow hive combs are split into channels that allow the honey to easily drip down to the bottom of the frame to be collected. The Bottom Section: This section consists of the hive base and the bottom board. Flow bottom boards often have screen ventilation that helps keep out pests. Hive Boxes: The major difference between the Langstroth and a Flow hive is in the hive boxes. Flow hives contain a special type of frame that allows honey to easily flow through and collect at the bottom. The honey can then be extracted from the bottom of the hive, without ever having to open up the box. The Upper Section: The top layer has a similar construction to the Warre hive, as they come with a sturdy roof to secure the hive. However, Flow hives do not have a quilt box and instead come with an inner cover, unlike the Langstroth. Now that you know the different types of beehives, it’s time to pick the best one for your desired results. Happy beekeeping!